As regular readers of this blog will know, I’m passionate about the use of relaxation and force-based methods for optimizing geometry in a very interactive way. There is a great variety of form-finding that can be done by assigning physical forces as interactions between sets of particles. However, in my investigations so far, the topology of these interactions has usually remained fixed. So the overall shape changes dramatically, but the number of points -and the underlying network of which point interacts with which- remains the same throughout the simulation. I have written about topology optimization before, in my post on self organizing structures, but the videos above use a fundamentally different approach than any of the examples shown there, as this new work is based on purely local interactions, which reconfigure their connectivity as the geometry changes. I did experiment a while back with a different technique for dynamic remeshing based on repelling/colliding particles or spheres (see this video, skip to around 1:27 for the mesh generation), but this was limited by a number of factors – although the spheres only exert force on each other when they are closer than a certain distance, they still need to be constantly checked against all the other spheres to see if they are within this distance. Checking every sphere against every other one means the number of interactions increases as the square of the number of particles, which becomes slow for even modest meshes of a few thousand vertices. There are various ways of significantly reducing this complexity and cutting down the number of distance calculations to be performed at each iteration (such as partitioning the space into cubic cells, and only checking for interactions between particles in the same or neighbouring cells). However, there still remains the question of how to remove or add spheres if they get too close or too spread out. Then even when a fairly equal distribution of points across the surface has been achieved, turning this into a clean mesh can still be tricky. 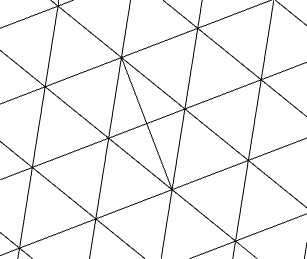 Notice that the irregular vertices of the triangle mesh (ones which have 5 or 7 connected edges instead of the regular 6) correspond to pentagons and heptagons in the dual. 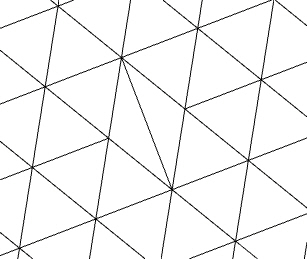 Finding the right number and placement of these irregular vertices is an important part of making a good mesh. 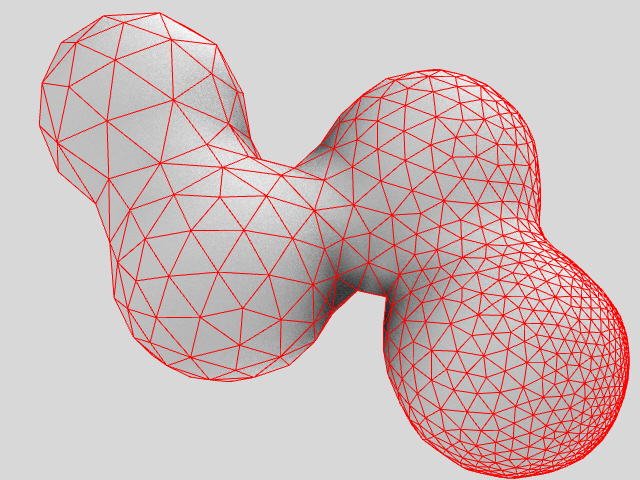 There is a close relationship between these irregular vertices and the overall topology and curvature of the mesh. Euler’s polyhedron theorem gives us a precise relationship between the number of faces/edges/vertices, and the genus of the mesh (F-E+V=2-2g). This is linked to Descarte’s polyhedron theorem, which relates the total angle defect at the vertices to the genus, and is itself a discrete version of the continuous Gauss-Bonnet theorem which describes a similar relationship for the integral of Gaussian curvature in the smooth case. 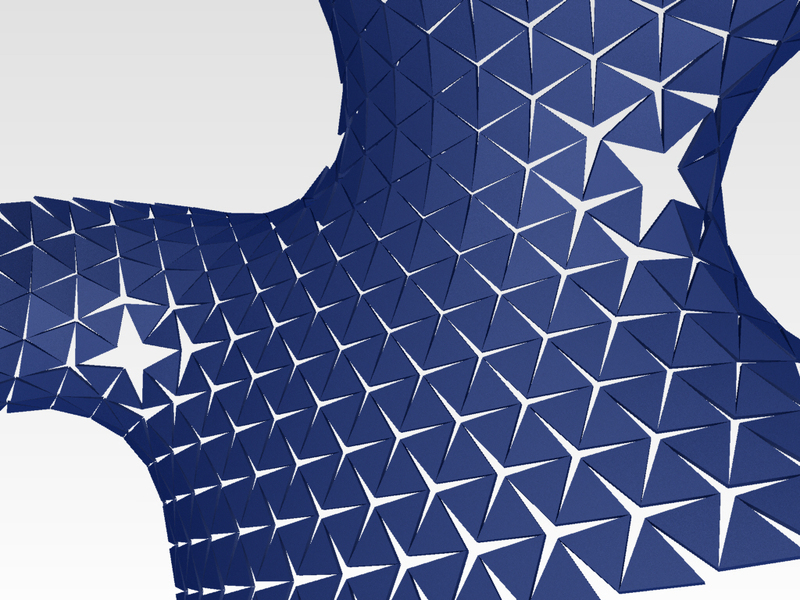 Keeping a good quality triangular mesh (close to even sized equilateral elements, with no obtuse, skinny or degenerate ones) can be very useful for many other types of optimization and simulation, as well as an advantage for fabrication if it is to be built as a physical structure. I’m thinking I could also vary the remeshing rules depending on whether the priority is regularity of geometry, or regularity of connectivity. 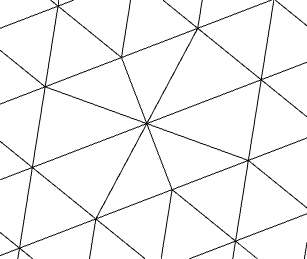 For example, on a sphere, a geodesic dome has a small number of irregular vertices (this is sometimes referred to as a semi-regular mesh), but a fair amount of variation in edge length, whereas solutions to the Thomson or Tammes problems reduce the variation of distance, but have larger numbers of irregular vertices. 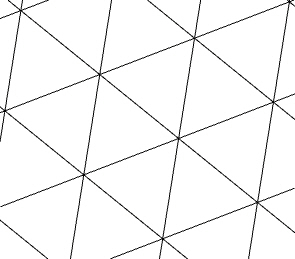 If the triangles all have identical edge lengths, then all of the angle defect is concentrated at the irregular vertices, whereas if the edges can vary slightly, the angle defect can be spread out across the mesh. 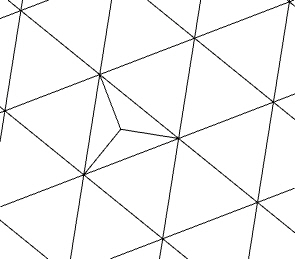 As mentioned above, by Descarte’s theorem, the total angle defect is fixed, but if the number of vertices is increased it can be divided between more of them. Subdividing each triangle (using a smoothing scheme such as Loop subdivision) does not alter the configuration of irregular vertices, but reduces the angle defect at each vertex (and in the smooth limit it approaches zero as the number of vertices approaches infinity). The remeshing can also be based on other criteria than just equal triangles. Reducing triangle size in high curvature areas is an obvious one, but I have a hunch there could also be some interesting ways of basing it not just on geometry, but on stresses, and using it for structural optimization. I find remeshing fascinating because the same geometric rules and operations have relevance across so many different disciplines and at a variety of scales. 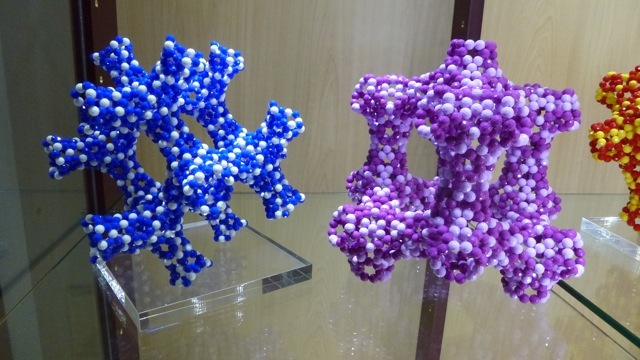 For example, in the carbon nanostructures graphene and nanotubes, which are hexagonal arrangements of atoms, there is a much studied crystallographic defect which occurs called the Stone-Wales defect – where instead of all hexagons we get 2 pentagons and 2 heptagons. It has important implications for the material’s mechanical and electrical properties. If we look again at our edge-flip move on a regular triangular mesh, and its effect on the dual, we see that it is exactly the Stone Wales defect! 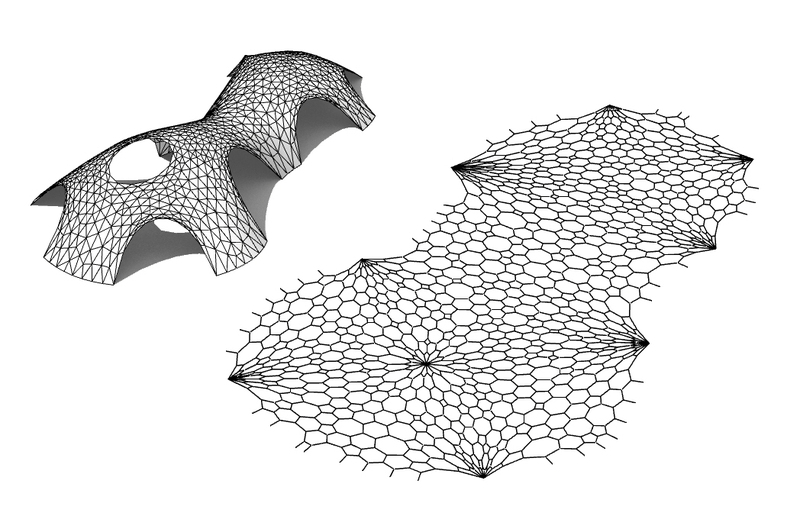 There are even hypothetical carbon nanostructures (proposed by Mackay and Terrones) in the shape of doubly curved triply periodic minimal surfaces known as Schwarzites. 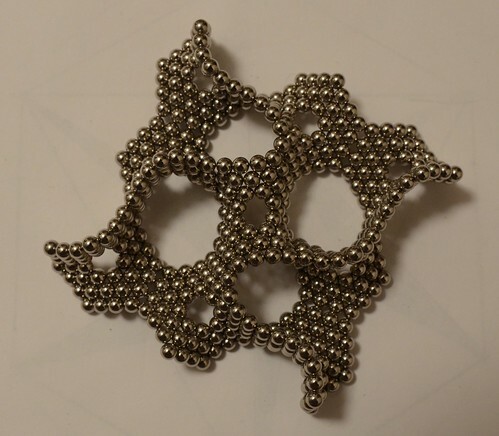 As the bond lengths between the Carbon atoms are very rigid, the only way these curved structures can be formed is through the variations in mesh connectivity. Going down to even smaller scales, we can even find the use of similar ideas about mesh connectivity in theories of loop quantum gravity, spin foams, and Regge calculus (for example, see Canonical Simplicial Gravity by Dittrich and Höhn, or The Feynman diagramatics for the spin foam models). Pachner moves or bistellar flips generalize the mesh moves described earlier to higher dimensional simplices. 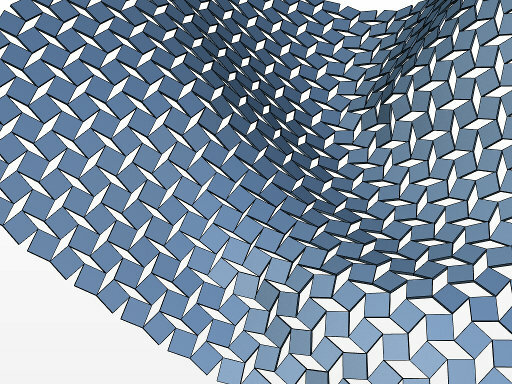 So as well being potentially useful for design, meshes and their properties have profound relevance to our understanding of the nature of space and curvature, because of the way they link the discrete and the continuous. I’ll be continuing to work on these remeshing tools and their combination with other types of relaxation and optimization. These recent developments are not publicly available for now, but I’ll update here with any news. A soliton is a kind of solitary, stable and localised wave which acts in many ways like a particle. They are useful in describing a diverse range of physical phenomena, and their mathematics is a large and active topic of research. A form of soliton even occurs in traffic jams, and here is yet another model of soliton like behaviour – the Jacob’s ladder toy. 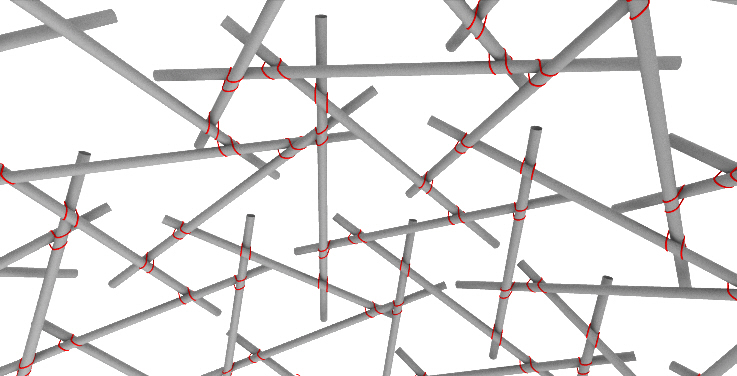 I see a link here with the the idea of bistable structures. 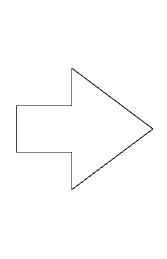 A normal elastic object has a single unstressed configuration, and if you bend it away from this shape(provided you do not bend it too far) it will always try and spring back to that one rest configuration. 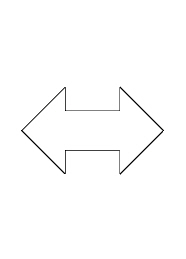 A bistable object on the other hand has 2 different states in which it is at rest, and in between a more highly stressed state. An example of a bistable structure that some readers may remember are the ‘snap bracelets‘ popular during the early 90’s. These were very similar to metal measuring tape – a strip of thin metal with a slight curvature across its short direction when straight along its length. 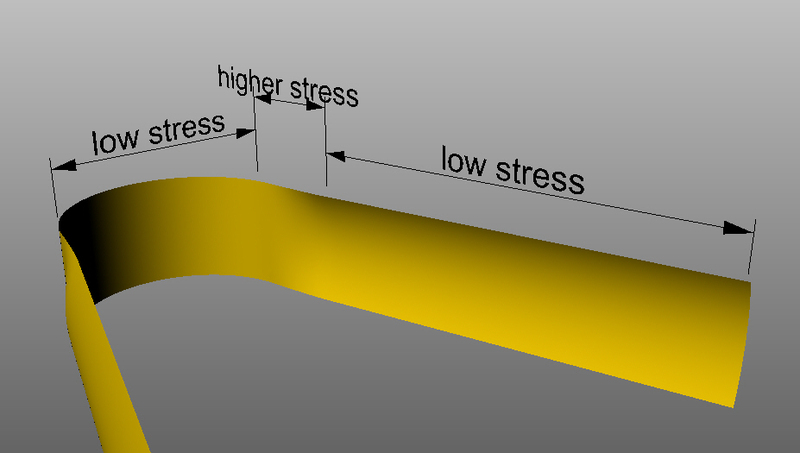 A normal metal tape measure is not actually bistable, because it is still stressed when in its rolled state, but it is much less stressed in the rolled or straight configurations than in the in between state. This allows a sharp bend to move along the tape while staying localized, a bit like the pendulum soliton. I’ve recently been exploring the idea of whether it is possible to create something similar, but on a surface, not just a linear element. Here I am also drawing on the idea of auxetic materials – defined as having a negative Poisson’s ratio. This means that unlike most materials which get thinner in cross section as you stretch them along their length, auxetics surprisingly actually get fatter. This can be achieved by small scale structures within the material behaving as linkages. 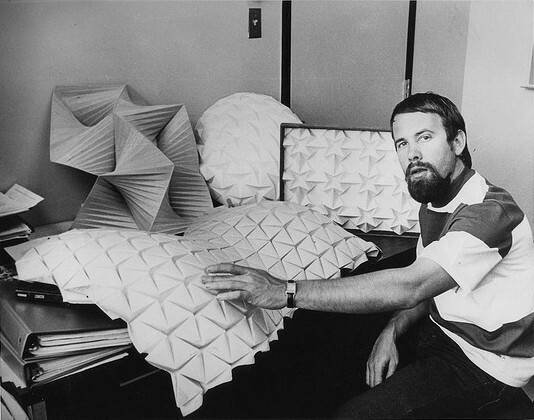 Many of the origami textured surfaces I have explored in previous posts actually have auxetic properties. Something I am recently trying to do is combine auxetic and bistable properties in a single sheet material through 3d printing. I’ll update when the test print arrives, but I’m hoping that the transition region between the two different contracted states of the material will behave something like a 2 dimensional version of the unstable region of the tape measure, causing some interesting out of plane buckling. Finally – sorry for such a long hiatus, it’s good to be writing again, more posts coming soon.